Pope Saint Leo IV was pope from April 10, 847 to July 17, 855. A Roman by birth, Leo had been a Benedictine monk and served in the papal curia under Pope Gregory IV. He was later appointed a cardinal by Pope Sergius II. Upon Sergius' death, Leo was unanimously chosen to succeed him and was consecrated as pope on April 10, 847. His pontificate was chiefly distinguished by his efforts to strengthen Rome's defenses and repair the damage done to the city by the Saracens, who had attacked it during the reign of his predecessor. Leo supervised the restoration of several important churches of the city, especially those of St. Peter and St. Paul. When the Muslim fleet again threatened, he rallied the leaders of the maritime cities of Italy—Rome, Naples, Gaeta and Amalfi—to form a league. The subsequent Battle of Ostia, in which the attacking Saracen force was destroyed, was one of the most famous in the history of the papacy during the Middle Ages. Leo held three synods, including one in 850, that was distinguished by his crowning of the Holy Roman Emperor Louis II. He also reportedly anointed the young King Alfred the Great of England. Leo's papacy is also noted for his attempts to bring rebellious bishops and political leaders into line with Rome. He excommunicated Cardinal Anastasius of San Marcello (later Antipope Anastasius Bibliothecarius) for disobedience and censured Archbishop Hincmar of Reims near the beginning of Hincmar's famous career. Leo IV died on July 17, 855, and was buried in St Peter's. He was succeeded by Benedict III. Several miracles are attributed to him. A medieval tradition claimed that a woman, Pope Joan, succeeded him, disguising herself as a man. However, the supposed Pope Joan is generally believed to be fictitious. The son of a Roman named Radoald, Leo received his early education at Rome in the monastery of Saint Martin near St. Peter's Basilica. 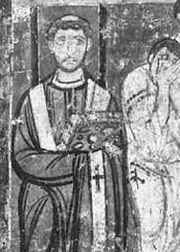 His reputation for piety and competence attracted the notice of Gregory IV, who made him a subdeacon. Later, he was created cardinal priest of the church of the Santi Quattro Coronati by Pope Sergius II. The Battle of Ostia in an 1829 engraving. Leo was unanimously elected to succeed Sergius II after the alarming attack of the Saracen pirates on Rome in 846, which severely damaged the city and many of its ancient churches. He was consecrated on April 10, 847. As soon as he became pope, Leo began to take precautions against a repetition of the Saracen raid. He entirely rebuilt 15 of the great towers of the city walls, putting these key defensive installations of the city into a thorough state of repair. To do this, he received money from the emperor, as well as aid from the cities and agricultural colonies of the Duchy of Rome. The work took him four years to accomplish, and the newly fortified portion was called the "Leonine City," after him. In 852, the fortifications were completed, and were blessed by the pope with great solemnity. 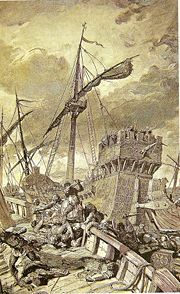 While the work of refortifying the city was in progress, a great fleet of the Saracens sailed for Rome from Sardinia. Leo succeeded in facilitating a coalition of Greek-Italian maritime city-states, including Rome, Naples, Amalfi, and Gaeta, to oppose the Saracen naval advance. The command of the unified fleet was given to Cesarius, son of Duke Sergius I of Naples. In 854 Leo fortified Civitavecchia, Italy, a popular Saracen target. Thereafter, the town was named Leopoli in his honor. 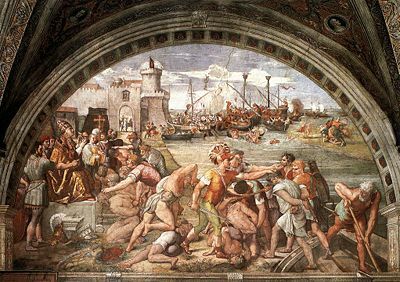 The coalition, aided by a providential tempest in 849, completely destroyed the Muslim fleet off Ostia. When the rebuilding of the walls of Rome was accomplished, Leo rebuilt Portus, the ancient harbor town on the right bank of the mouth of the Tiber, south of Rome. Its governance was given to a number of Corsican exiles, who had been driven from their homes during the previous assaults of the Saracens. Other cities under the control of the Roman duchy were also fortified, either by the pope's own efforts or as a result of his encouragement. The Battle of Ostia, traditionally attributed to Raphael but now thought to be by one of his assistants c. 1514-1515. Pope Leo IV is pictured at the far left. Leo also labored to restore the damage which the Muslim raid of 846 had done to the various churches in Rome. Saint Peter's itself had suffered very severely. The old church would never reach its former magnificence until it was entirely rebuilt during the Renaissance, but Leo managed to make parts of it more beautiful than it had been before. Its altar received a new gold covering, which weighed 206 pounds and was studded with precious gems. Leo also restored Saint Martin's monastery, where he had been educated, and the church of the Quatuor Coronati, of which he had been the priest. Other church buildings whose restoration he supported included the Lateran Palace, St. Paul's, the Anglo-Saxon Borgo, Subiaco, and many other places both inside and outside of Rome. Leo also built the church of Santa Maria Nova to replace the decaying Santa Maria Antiqua. In 850, Leo crowned Louis II of Italy, the son of Lothair I and great-grandson of Charlemagne, as holy roman emperor. Three years later, according to the Anglo-Saxon Chronicle, he anointed and blessed the five-year-old King Alfred the Great of Wessex. Leo reportedly "hallowed the child Alfred to king by anointing; and receiving him for his own child by adoption, gave him confirmation, and sent him back [to England] with the blessing of Saint Peter the Apostle." Fresco of Leo IV in the basilica of San Clemente, Rome. The same year (853), he held an important synod in Rome, in which various decrees were passed for the enforcement of ecclesiastical discipline and learning. The council condemned Cardinal Anastasius of St. Marcellus, who had previously been the librarian of the Roman church and would later be better known as Antipope Anastasius Bibliothecarius. It also censured Archbishop John of Ravenna, and Leo went personally to Ravenna to enforce the decree. 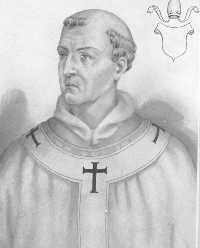 Another man who defied the authority of the pope was Duke Nomenoe of Brittany. Nomenoe sought independence both from Leo and Charles the Bald, then king of West Francia. Nomenoe deposed a number of bishops and appointed new ones, placing them under the jurisdiction of a metropolitan see of his own creation. This independence would continue until the thirteenth century, when the bishops of Breton were once again subjected to the authority of the archbishop of Tours. Leo was also involved in attempting to secure the obedience of one of the most famous churchmen of the era, Archbishop Hincmar of Reims. In 847, Leo had supported Hincmar's accession at Reims and granted him the pallium as a symbol of Rome's support. One of Hincmar's first concerns was to restore to his metropolitan see the domains that had been alienated under his predecessor, Ebbo, had given to laymen. Hincmar was in constant conflict with the ecclesiastical clerks who had been ordained by his predecessor, and he excommunicated one of them, who was an imperial vassal. Having exceeded his ecclesiastical authority, and also having caused political problems for Rome, Hincmar was condemned in 853 at the council of Soissons. He would go on to have one of the most remarkable careers in ecclesiastical history of the Carolingian period. It was while Leo was involved with the controversy with Hincmar that he died. He was buried in Saint Peter's Basilica on July 17, 855. He is credited with being a worker of miracles both by his church biographer and by the eastern Patriarch Saint Photius. While few facts are known of his spiritual life, Leo IV was a skillful organizer, administrator, and fundraiser who did much to protect Rome from the very real Mulsim threat of the ninth century. His greatest contribution was in strengthening the defenses of Rome, rebuilding many of the city's beautiful churches that had been damaged in the war with the Muslims, and forging alliances with other Italian city-states to join forces against the impending Saracen naval invasion. The Battle of Ostia, in which Leo's coalition-building skills were instrumental, was celebrated in a famous fresco by Raphael and his pupils in his rooms of the Vatican Palace. 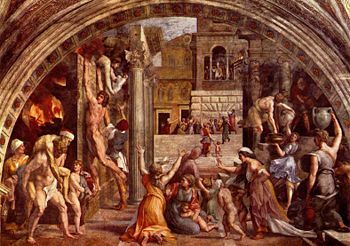 The Fire in the Borgo, designed by Raphael and thought to be painted by his assistant Giulio Romano, shows one of the miracles attributed to Leo IV. When a fire that broke out in the Borgo in Rome in 847, Leo IV, shown in the distance in his window, reportedly turned back the flames by making the sign of the Cross. Leo is perhaps even more famous for being supposedly succeeded by a woman, Pope Joan, who reportedly reigned for three years between Leo IV and Benedict III, disguising herself as a man. However, the supposed Pope Joan is generally believed to be fictitious. Cheetham, Nicolas, Sir. Keepers of the Keys: A History of the Popes from St. Peter to John Paul II. New York: Charles Scribner's Sons, 1983. ISBN 9780684178639. Coppa, Frank J. The Great Popes Through History: An Encyclopedia. Westport, CN: Greenwood Press, 2002. ISBN 9780313324185. Davis, Raymond. The Lives of the Ninth-Century Popes (Liber Pontificalis): The Ancient Biographies of Ten Popes from C.E. 817-891. Translated texts for historians, v. 20. Liverpool: Liverpool University Press, 1995. ISBN 9780853234791. Morrison, Karl Frederick. Tradition and Authority in the Western Church. Princeton, NJ: Princeton University Press, 1969. ISBN 9780691071558. History of "Pope Leo IV"